Sometimes you lose on one fish but ultimately win for the day. Those days are a roller coaster, especially when friends are around to witness your defeats. Some of those defeats sting more than others. Last Tuesday I had one that really stung. I was floating with some friends, not guiding, just fishing together. Everyone had caught some nice trout including one really nice rainbow that was a personal best for the angler. I had spent a lot of time on the oars, more interested in watching my friends catch fish than fishing for the most part. For one section, though, I was willing to give up the oars for a short 200 yard stretch. 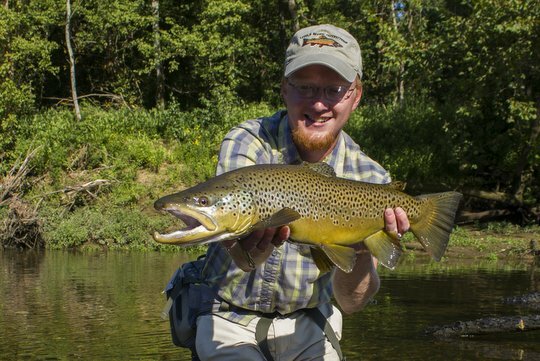 A large brown had shown itself repeatedly on previous trips, and I was determined to catch him. Sure enough, as we were drifting peacefully along, I suddenly saw a submarine large brown trout materialize under my indicator and saw his mouth open. Things are a bit fuzzy from that point on, but I'm fairly certain that I set the hook before the indicator even moved. The fish was definitely on, but when the large trout came to that realization, he remembered a very important appointment he had somewhere upriver. The only surprise here is that he didn't break me off and simply spit the fly after a long run which saw my real screaming and my buddy Pat, who was on the oars, asking, "What should I do? What should I do?" In the end, there was nothing anyone could do because it was over before I even had much chance to think. Both the rower and myself had done everything right (or at least had not done anything obviously wrong) but the fly simply popped out. The next day on the river, I was floating with my buddy Tim and his friend Andy. They scored what may well be the Double of the Year. That was the highlight of the day at the time, but something else would prove to be even more important a couple of days later. We were floating through an area that always holds a lot of trout. 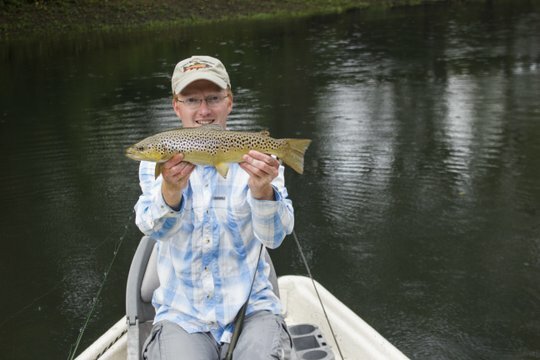 Several quality brown trout were spooked by the boat but that is not unusual. What captivated my interest was one large fish in particular. I made a mental note of where the big fish was hanging out and vowed to return...soon. On Friday I was finally free. Fishing time for myself always gets me excited, and I took full advantage of the lull in my schedule. Getting to the river right as the water was dropping allowed me to get in and start fishing before the crowds got too bad. I worked my way down to where I had spotted the nice fish. Another angler was nearby so I didn't head right in to fish for the hog. My original plan was to fish with a dry fly and midge dropper but the higher flows made that difficult. Soon I switched over to an indicator rig which allowed my flies to get down to the level of the trout. That brought some results, but still not the big trout I was hoping for. Finally, after one particularly long drift, my indicator shot down and when I set the hook a big fish immediately started cartwheeling. The pink stripe told me that I had a big rainbow trout on the end of my line. In between the jumps, I was able to turn the fish and assumed I had a good shot at landing it. Then, suddenly, it started to take off, and I could no longer turn it. About that time, a drift boat edged in behind me and dropped anchor. I turned to see my good friend David Perry jumping out with a net. Suddenly, my hopes revived. I might have a chance with a little help. As I slowly fought the fish, I realized my problem. On one of the jumps, the top fly had snagged the fish near the tail. In the ensuing commotion, the little midge that had originally hooked the fish had popped free. A 20" tail hooked rainbow is one tough customer. Eventually, I worked the fish in close. Close enough that I was starting to think this might actually happen. Then, the fly simply popped free. There was nothing much to say. David P. jumped back in his boat to continue the float with his two clients. I was left with a memory of a big trout jumping across the river and a screaming reel. By this time, I was resigned to probably not finding a large trout. Luck seemed to be against me on this week. Sometimes you win and sometimes you lose and things were definitely not looking promising. About this time, the angler below me worked up a little closer and made some comment about a huge fish cruising around where he was fishing. I knew it was probably the trout I had come looking for but bided my time. Eventually, obligations pulled him away from the river and I was left to check on the big trout for myself. I waited a little longer as another drift boat was moving down behind me. They moved through the run without noticing the shark lurking under the surface. The fish was still mine. Noticing some risers nearby, I changed back to my dry fly and midge dropper rig to work the nearby fish. Resting the big fish a little more, I finally couldn't stand it any longer and made my way down. Almost immediately I spotted it. The fish looked even larger than I remembered. Long enough, for sure, but extremely thick. I wanted to catch that trout in the worst way. My position was good for a clean drift. I was up and across from the fish which made a down and across slack line presentation the best option. I made the cast, tossed a couple of mends and some more slack in the line, and the flies were on their way. The big fish saw my midge and moved confidently over. I saw the mouth open and set the hook...and the fish spooked. Somehow the fly didn't, catch but the fish definitely realized something was wrong. He bolted for cover and disappeared quickly. Spotting some other trout, I cast to them for a while, hoping for a consolation prize. At this point, I would have been glad to see any fish just to take the sting away from missing such a great fish. In all the excitement I had not really noticed, but now that I wasn't focused on the big brown trout I noticed that my toes were numb. This helped me to remember why I never wet wade on the Caney, even in the heat of summer. I considered heading for dry ground to let me feet recover some warmth and then glanced back to where the large fish liked to feed. This sounds unbelievable, especially if you know anything about large trout, but the big brown had returned and was again chowing down on midges and blackfly larvae. Fate had intervened to give me another chance. Not willing to risk having someone come by and spook the fish, I quickly made an almost exact replica of the previous cast and drift. The fish moved over again and inhaled my flies, and this time the midge stuck firmly in his jaw. 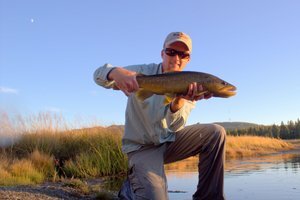 I almost regretted fishing my 7'6" Orvis Superfine Glass rod at this point. The four weight was no match for the big brown as far as power was concerned, but in the end it was the soft tip of the glass rod that protected the 6x tippet long enough to give me a chance to land the trout. The fish quickly ran me almost into my backing while I stumbled along down the river behind, walking on numb feet and slipping on the algae covered gravel and small rocks. Throughout the fight, I had to remind myself to keep the rod tip up. My arm was getting tired! Finally, after numerous last minute surges, each of which made my heart stop, the big brown trout slid into my spacious net. Even in the big net this fish looked big. It was also very heavy. I stumbled towards the bank, keeping the fish in the water as I went. Just then, a passing canoeist asked if I would like a picture. He didn't need to ask twice. This blessing enabled me to get a couple of excellent pictures of the big brown, something I probably couldn't have accomplished on my own while keeping the fish in the water well enough. When I measured the fish against the net, he stretched out to between 23 and 24 inches. That made the picture that much more meaningful: this was my personal best brown trout on the Caney Fork. Thanks again to Bob Mansolino for kindly stopping and taking a picture for me! When I released the fish, he swam off strongly. I'm already planning on catching this fish again in the near future, or better still, helping one of my friends catch him. After losing all those fish last week, redemption was sweet. 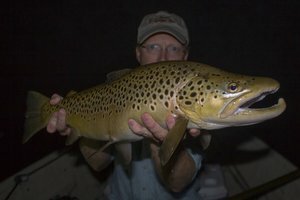 While I had been fighting this big brown trout, I promised myself that if I landed the fish I would call it quits for the day. After watching him swim off, I remembered my numb toes so keeping that promise was even easier. I walked away from the river while the sun was still well up in the sky, completely satisfied with my few hours on the water. Guide trips seem to always be in a state of flux right up until the moment I meet the angler(s) for the day. This past Friday things were no different. Deb had fished with me before, but the friend she was supposed to bring would be on the water with me for the first time. Unfortunately, at the last second, that friend had to cancel, but of course Deb was still all for a day on the water. Part way through the trip I would discover why. We started off the trip in a steady rain. The radar did not look promising, but if I have learned anything while guiding, it is that I should not cancel a trip for weather reasons unless it is truly dangerous. Deb was a trooper and would not be deterred by the water falling from the sky. The early portion of the float was unusually quiet. I commented on the fact that normally we would have had some quality fish earlier in the float and started through my fly changing routine. Eventually we settled in on some patterns and started drifting again. A few smaller browns were hooked. Some were landed, and some were lost. Then, we reached an area where I was certain we would find some good fish. It was just a matter of what flies would be necessary to make that happen. Right as I was about to go through another fly pattern change, the indicator took a determined dive. Deb set the hook and the battle was begun. Quickly dropping everything required to rig up differently such as fly boxes and tippet spools, I grabbed the oars and started chasing what was quite obviously a large rainbow. The fish surged up and down the river and we stayed hot on its tail. The one thing that stood out to me during this fight was how calm an angler I had in the front of the boat. 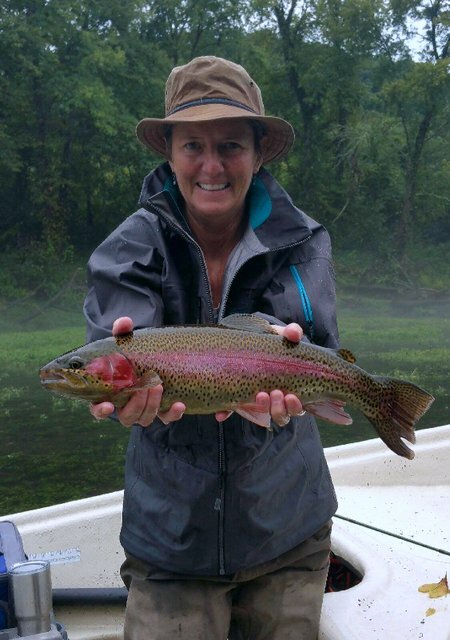 A lot of people will get tense and make a mistake when fighting a large trout but not Deb. She was enjoying the experience immensely though, that much was obvious. Before long, I slid the boat into shallow water and jumped over the side with the net. This fish wasn't going to have any chances for escape. The rod lifted, the net dipped, and the big rainbow trout was safely where we could enjoy it briefly. Pictures were taken and then Deb commented, "That is my birthday fish!" I'm really glad she waited to tell me until after catching such a great fish. If I had known that her birthday was last week the pressure would have just about killed me. Thankfully, the fish posed for a couple of pictures and was soon released to be caught again another day. After high fives and a moment to soak in the moment, we pushed back out into the river. I was about to row back upstream, and in the meantime Deb had cast out to get her line ready. Right as I pulled hard on the oars to head up for another pass, her indicator shot under again. No way, I thought. Sure enough, we had as close to a repeat performance as is possible, except that this fish was a little longer than the 19.5" fish that we had just released and a whole lot heavier. Back to back quality trout and we still had a lot of the float to go. By this time, the rain had eased and we were left to drift down the river under leaden skies. The calm was almost eery at times, but also beautiful and a real treat to experience the river this way. We picked up some fish here and there, but soon our time was drawing to a close. I really wanted to put her on one nice brown trout and knew just the place to do that. That was the easy part. The hard part was making a very long and pinpoint accurate cast and then getting a good drift. Of course, Deb was up for the challenge. The fly lit softly on the water and started drifting. Suddenly the dry fly sucked under as the trout took the midge underneath. She set the hook like a pro and again we were rowing all over the river. This fish didn't take as long as the big rainbows, but was still an excellent trout to end the day on. We were soon pushing on down to the takeout, another good day on the water behind us. 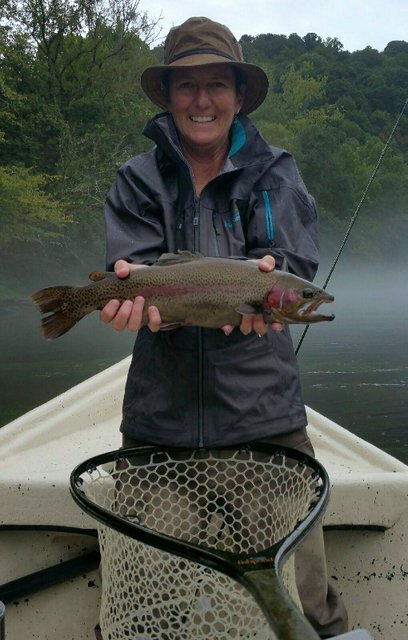 This week and next week both have some guide trip openings, so if you are wanting to experience this great fishing, contact me to learn more about a float trip with Trout Zone Anglers. While I have a ton of cool experiences as a fly fishing guide, I rarely find the time to share them with the world unfortunately. However, yesterday was one of those days that was incredible enough that I just can't contain it anymore. 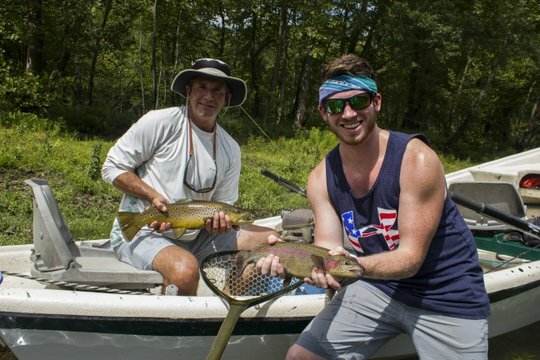 One fish is in the running and currently the lead for guide trip fish of the year, but to have two great fish at once? Priceless. Let me tell you about it. My buddy Tim Helton has, in one short year, become a true fishaholic, or maybe he is an aspiring trout bum. Regardless he spends as much time as possible on the water and many hours of his time has been on trips with me. Our first trip together was in the Great Smoky Mountains on Little River. 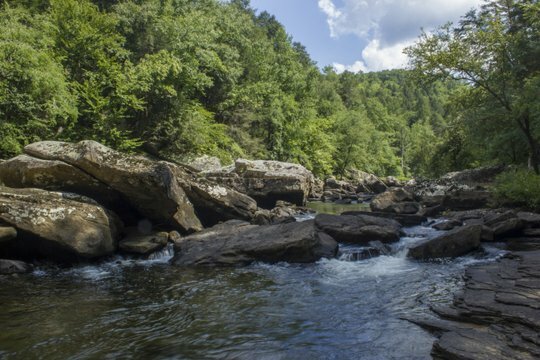 We hiked up the trail a ways above Elkmont and covered the finer points of high sticking a Smoky Mountain stream for the beautiful wild trout found there. As I remember, we caught some nice rainbows and a couple of browns during our time together that day. Since then, Tim has fished all across east Tennessee, and I have had the privilege to share many of those moments on the water with him. Like any good angler, Tim has become quite interested in catching some big fish. Over the last months, he has had a lot of big fish on the end of the line. Like most anglers, the story progressed from hooking big fish, to eventually hooking and landing big fish. Those two things don't always go together unfortunately. This year, we had already caught some great trout together. Those big fish did eventually come with a lot of perseverance and dues paid in time on the water. Yesterday was the first time we shared a day on the boat together. This trip had been planned a time or two before, but finally everything came together and Tim along with his friend Andy arrived at the river ready to jump in the boat and catch some trout. After lunch, we shoved off into the lazy current and started drifting again. Both guys were hooked up again on some healthy rainbow trout before we started approaching the next run. We netted those fish and got on to more important things, the hunt for larger fish that is! I directed both guys to cast into the deep water to the right of the boat and they got their drifts going perfectly. Tim's indicator shot down a split second ahead of Andy's, but I immediately knew we were in trouble. Neither fish had any inclination to come up without a fight and we had two on at the same time. Directing the battles from the rower's bench, I started gently easing on the oars to back the drifter into calmer water. The fish would surge, but both guys kept their rods up and the rod tips protected the 6x tippet. When I got a glimpse of the fish, I was in about as bad of shape as Tim and Andy were. They were impressive fish! 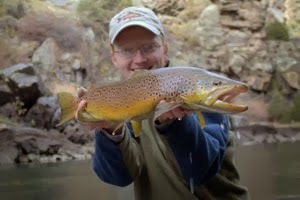 Tim's big brown trout (the one with the big jaw he wanted of course!) was the first to hit the net and Andy's big rainbow was close behind. I had the guys take a quick "Double" picture together to verify what would otherwise be a ridiculous and unbelievable story. I took the pictures and still have to check every few hours to make sure it wasn't a dream. As is the case with many big fish stories, the rest of the day was anticlimactic. Both guys were thoroughly spoiled but a river that has been treating me great all summer. A hookset on a 12" fish would invariably bring a comment such as, "Oh its just a little one." Before you start thinking I started floating another river, let's clear that up now. This is the same river I've been having some great guide trips on lately. The difference on this particular float is because I got to do some fishing as well. Shocking, right? I've been very busy this summer with lots of guide trips. Naturally that is a good thing, or at least that is what my bank account would say. The only downside so far as I can tell is that I haven't done much of the kind of fishing where I'm the one holding the rod. It would be fair to say I have been fishing a lot, just not in the traditional sense, and I was ready for a day of throwing the fly rod. When my friend Bill Bolinger from Little River Outfitters had to cancel our fishing trip together at the last second, I almost decided to just wade fish for the day instead. After considering my options, I decided to check with some other friends and eventually found someone who was able to go. Don Hazel heads up the Fly Fishing Club here locally at Fairfield Glade. After having an epic experience on a guide trip with me the week before, I knew he was already dialed in and ready to catch some fish. He came prepared with all the correct flies and his rod was rigged and ready to go so we quickly dumped the boat in the river, ran the shuttle, and started floating. 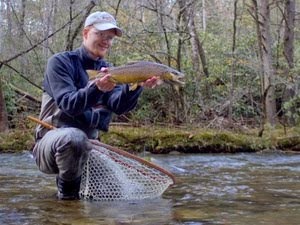 It did not take long to start seeing a few fish flash on the streamers we started with, but something unusual happened. The generators were scheduled to shut off at 11:00 AM but we passed right by the cutoff point with no reduction in flows. Realizing that something was up, I headed for a calm backwater behind an island to anchor the boat for a while. We relaxed and took our time messing with the streamers until the water took on that glassy appearance that signals the end of generation. That was our cue to pull the anchor up and start drifting. 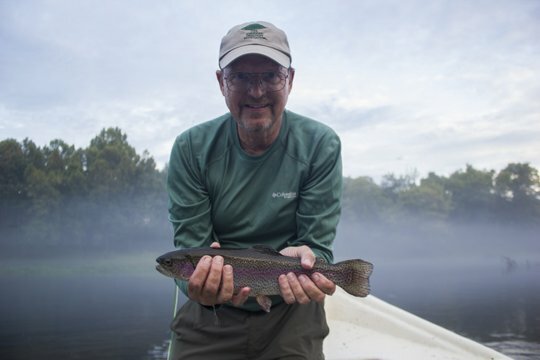 Anyway, back to my day on the water, Don was the first to strike with a nice rainbow trout and from then on, we were catching fish one after another on down the river. There was only one other drift boat out on the river along with 5-10 kayaks but that was it. Boat traffic has slowed down with the beginning of school and that is a good thing. The river is still very busy on weekends. If you are going to fish it right now, please release all of your quality trout. 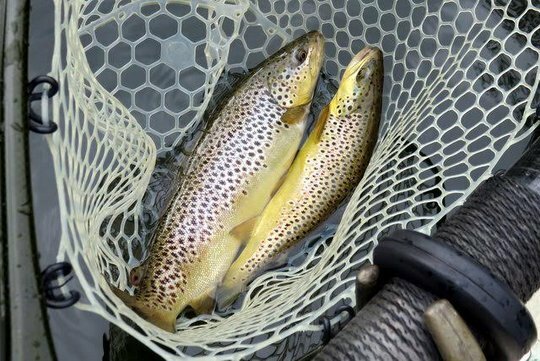 The river is seeing a LOT of pressure right now and it only takes a few people keeping those big trout before the fishing quality goes seriously down hill. The number of people not abiding by the regulations never ceases to amaze me. 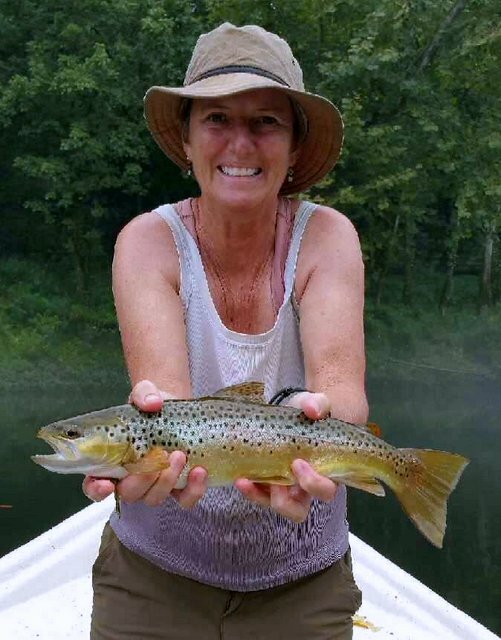 If you witness anyone keeping fish in the slot (catch and release on rainbows and brook trout from 14"-20" and only one brown trout may be kept a day with a 24" minimum length requirement), please call the TWRA Poaching hotline (https://www.tn.gov/twra/article/poaching-hotlines) and please notice that the Caney is partially in both regions two and three. As Don and I continued down the river catching fish here and there, we began to wonder if we would find any of the good fish that have been regularly showing up on every float. I had a good idea where to look but for the first couple of miles, those larger fish proved to be elusive. Eventually that would change however. We were drifting through one long pool that sometimes has produced nice fish for me (don't they all?) and were fishing both sides of the boat. Don's indicator dove and I glanced over to see what was going on. When I looked back, my indicator seemed to have disappeared as well so I set the hook just in case. Turns out that was the right move. I immediately felt resistance and we were into a nice double. I scooped his fish into the net with one hand while playing my trout with the other. Handing off the net, I told him to keep his fish wet and continued to battle the nice trout on the end of my own line. Eventually, my fish tired and came to the net. Talk about a great double! Two gorgeous brown trout in the net at one time and they were quality fish to boot. We took some pictures and then calmed down enough to keep moving on down the river. Eventually we even started fishing again! The day drifted slowly by in about the same way. Fish were caught here and there and eventually we were nearing the time to call it quits. I wanted one more fish and turned to a rod rigged with a dry fly and dropper midge to accomplish that goal. Sure enough, along a calm edge with scattered risers, I found a willing brown trout that took the midge very softly. 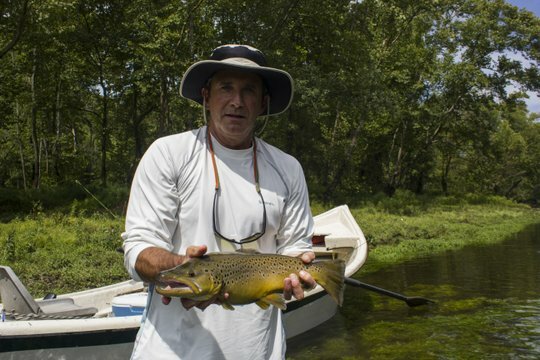 The ensuing fight was anything but soft though as the strong brown trout ran all over the river. Before long, another great fish was in the net, and I had my picture taken with yet another beautiful trout. Not to be outdone, Don pulled a really nice rainbow trout out just as we started pulling up to the takeout. The fish were still feeding and I was not entirely excited about leaving feeding trout, but I knew that morning and another guide trip would come early. More flies needed to be tied, especially after finding success on a new pattern I've been working on. The small number of samples I tied wouldn't necessarily last through a guide trip the next day. This summer I have been on my usual warm weather smallmouth bass kick and have enjoyed exploring both new waters and old. After my last epic adventure, you would think that staying away from the smallmouth streams for a while would have been the best choice. Despite all of the dangers, I couldn't get the memory out of my mind of the big wild smallmouth fighting on the end of my line. Thus it was, just a couple of days after my last trip, that I found myself heading towards one of my favorite smallmouth streams. Now, I have to explain the favorite part just a little. Favorite can mean a lot of things. For me, a large portion of what determines "favorite status" is familiarity. This particular stream I'm very familiar with, or at least I'm familiar with the portion that is a reasonable half day trip from the access area. The bass are not the largest or most numerous, but they are there and with a little work are willing to come to the fly. I grabbed all of my equipment and was soon headed to a section that I enjoy. This is an area I call the Narrows, although I'm sure the white water paddlers have another name for what must be some very serious rapids when the water is up. The cliffs come in tight to the stream and huge chunks of rock all but block the flow of the stream. Getting around this area can be very tricky, but I have, over time, pioneered several rather sketchy routes up on the bank and around the worst of the deep pools and massive boulders. I say sketchy because it looks like snake heaven, and I'm sure it is. I just haven't found them yet. Anyway, I tied on the same black Chernobyl Hopper that had done well for me on previous trips. A few bass came to hand that way and I stubbornly stuck with it all the way up to the Narrows. After climbing up and over the huge piles of debris that are deposited during high water, I came to a deep but narrow pool that always has some nice fish swimming around in it. The topwater fly was presented to all the likely areas, and I managed one decent little smallie. Based on the shadows lurking in the depths, I knew that I should be doing much better. Remember a fly that I had done well on during my last smallmouth trip just days before, I pulled out the weighted fly and quickly changed strategies. On just the second or third cast, it happened. A large shadow inhaled my fly at least 5 or 6 feet under the surface. I could see just well enough to know it was time to set the hook. When I did, it was nearly a repeat of the big bass I had caught a couple of days prior. 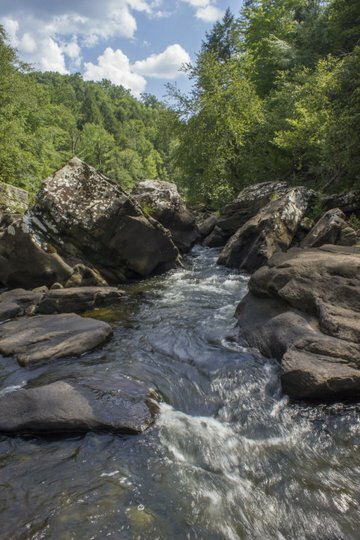 The fish ran under as many rocks as possible, and I held my breath as the tippet sawed back and forth over the rough edges. You would think that my lesson would have been learned on the last trip, but instead of bringing a heavier rod, I had the same 5 weight as before, and the wily smallmouth bass took full advantage of my lack of leverage. Finally, the fish slid back out from under the rock it had been trying to make home and I slipped my thumb inside its mouth for a grasp of the jaw. 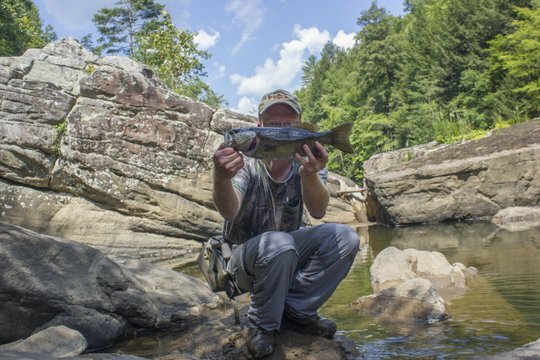 Another great Cumberland Plateau backcountry smallmouth bass to remember!